Humans absorb information best in story form – and yes, we are all natural born storytellers, yet as we enter adulthood we do less and less of it; what a missed opportunity. Let’s talk about you, the agents and brokers in the Real Estate Business; you will truly breakthrough when you realize that you are in the business of information, and that the best way to convey it is via telling stories. I must admit that I have come to despise machine generated narrated tours, you know the kind that reads a bunch of text you have written without taking a breath, and does it in a British accent, and does not sound at all like you – not even close. These machine narrations rob the agent from shining; they dehumanize the relationship and create a machine barrier between the listing agent and the consumer. A good storyteller realizes that our voices have power; the way our words have intonation conveys our energy and passion; and one important aspect of telling stories is knowing when to pause and say nothing. 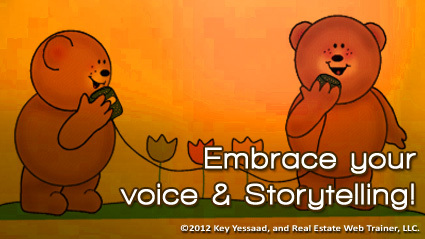 I encourage my Real Estate Colleagues to come out from behind the shadows of machine generated Gobbledygook and embrace their natural voice; it is our job and passion to tell the story of Real Estate, and do it well!